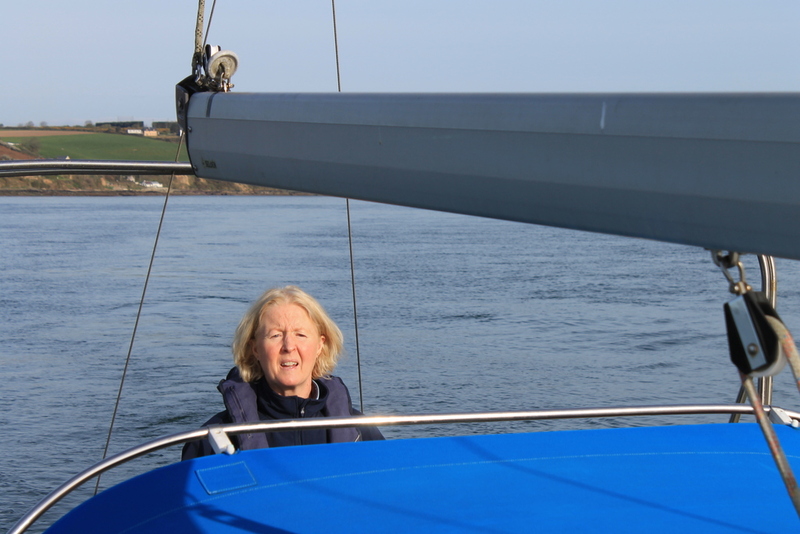 I recently had the opportunity to spend the day on Clare’s Orcasailing from her over-wintering berth in Crosshaven (on the west side of Cork Harbour) back to Dungarvan. (Thanks Clare). Click all pics for larger sizes. 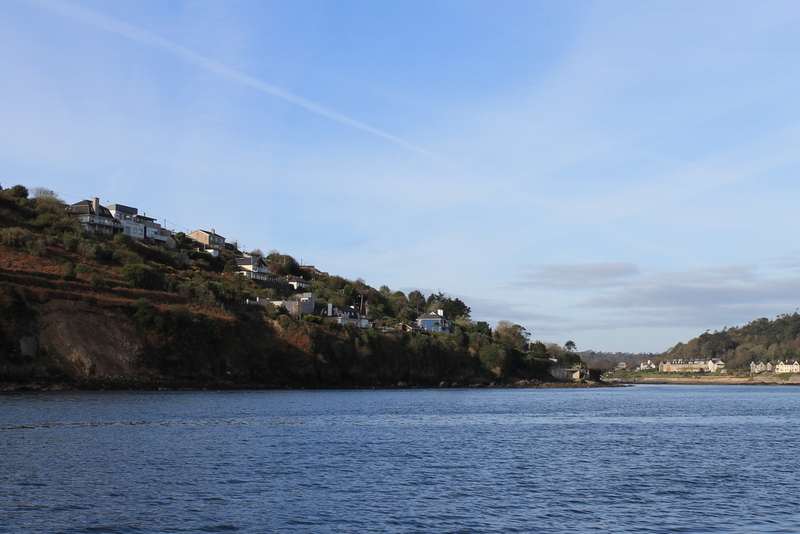 Crosshaven is the home of the world’s oldest sailing club, RCYC. 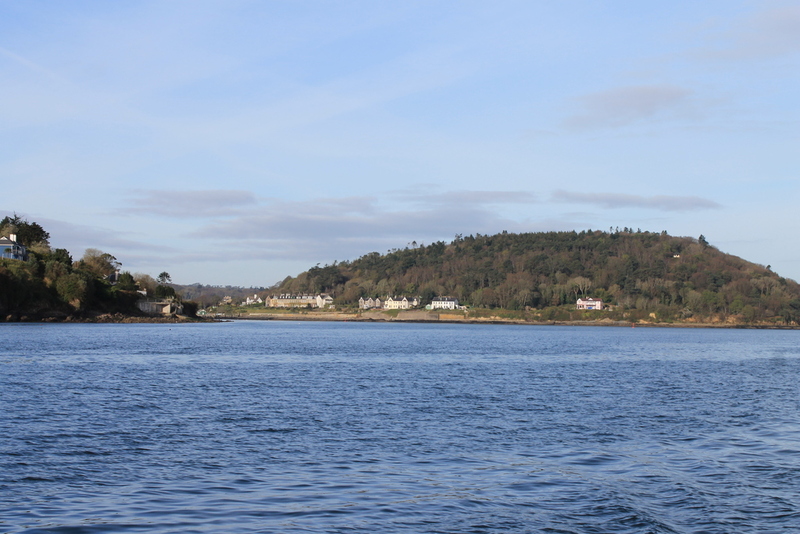 Cork Harbour itself is considered the finest natural harbour in the islands of Ireland and Great Britain. 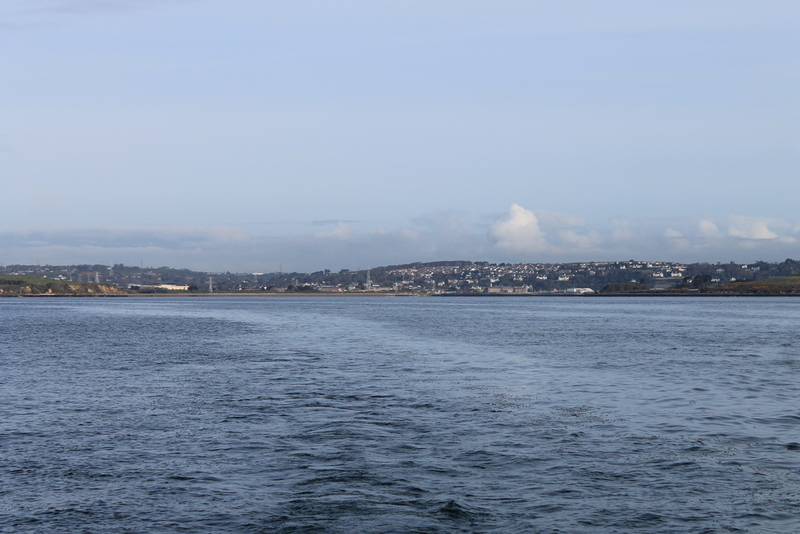 Winston Churchill made a speech after WWII telling the Irish people we were lucky he didn’t just take Cork Harbour. (Yeah, that’s one of the Churchill speeches that gets less publicity). 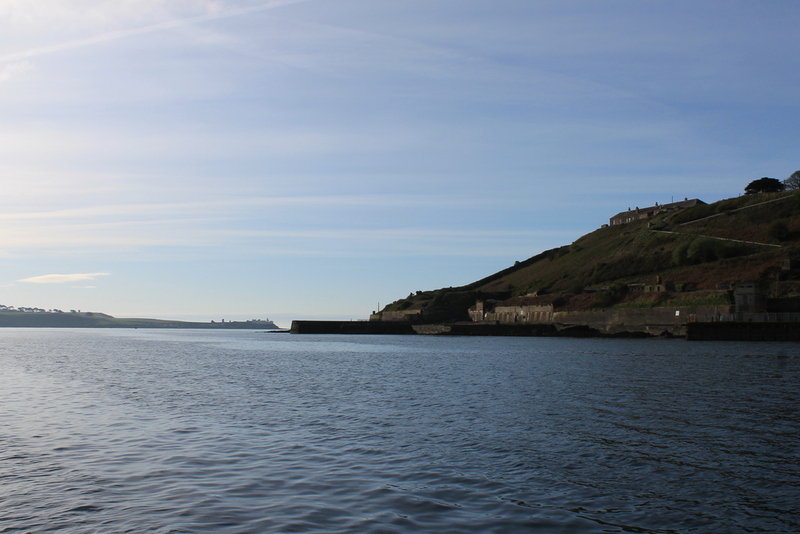 Each side of Cork Harbour is protected by old Forts. 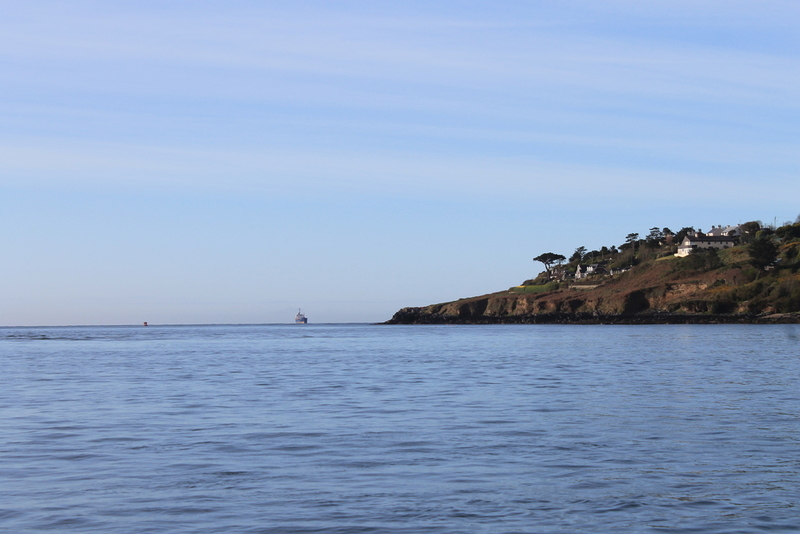 The day started out beautiful, sunny, blue skies and flat water. And no wind. 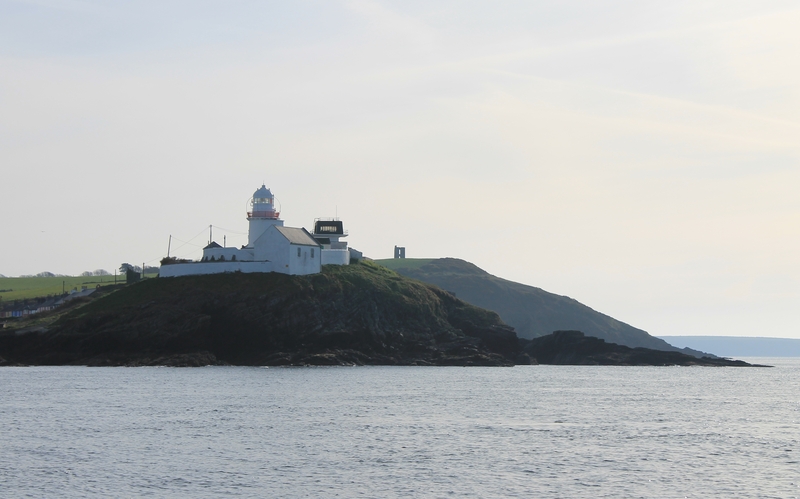 Roche’s Point Lighthouse is famous as a Sea Area Weather Forecast location, and is situated on the east headland at the entry to Cork Harbour. Cobh (pronounced cove) used to be known as Queenstown, famously the last port of the Titanic (Titanic 100 week there this week). 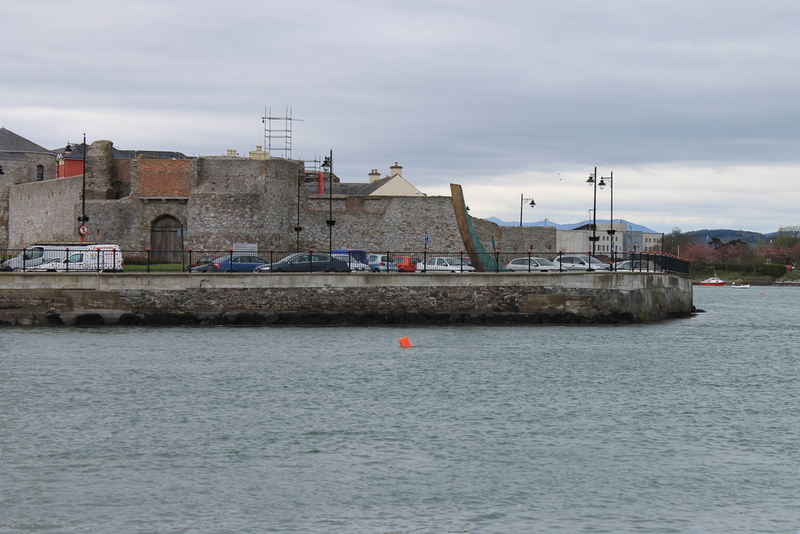 Spike Island was a prison and is now one the three Triple Crown Of Prison Swims (Spike, Alcatraz, Robben) which only Ned Denison and Mike Harris of Sandycove and Gary Emich of San Francisco have completed.) The harbour is so large there are a few islands within it. 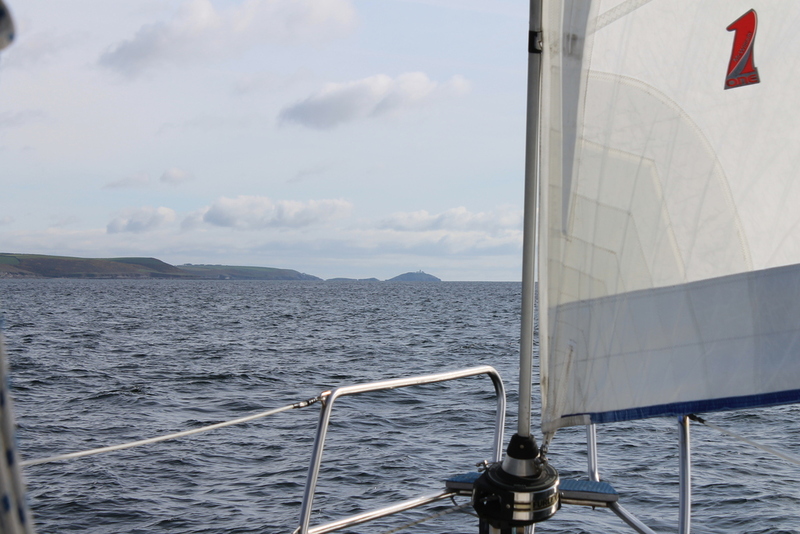 The water always seems to be choppy around the harbour entrance with strong currents running. Roche’s Point Light is very pretty on a nice day. 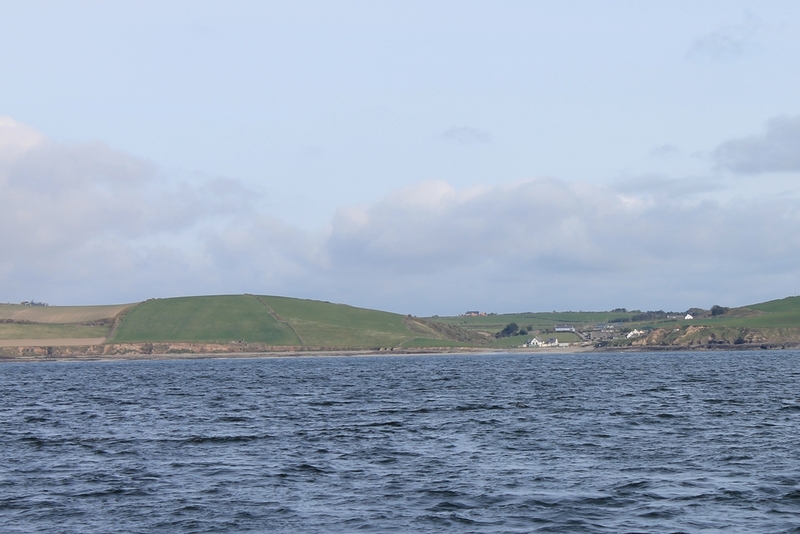 In 2008, Danny Walsh, Eddie Irwin, Ned Denison, myself and Niall O’Cruallaich swam from Roche’s Point to Power Head, from a boat drop. Niall and myself swam most of the way back before the tide stopped us. 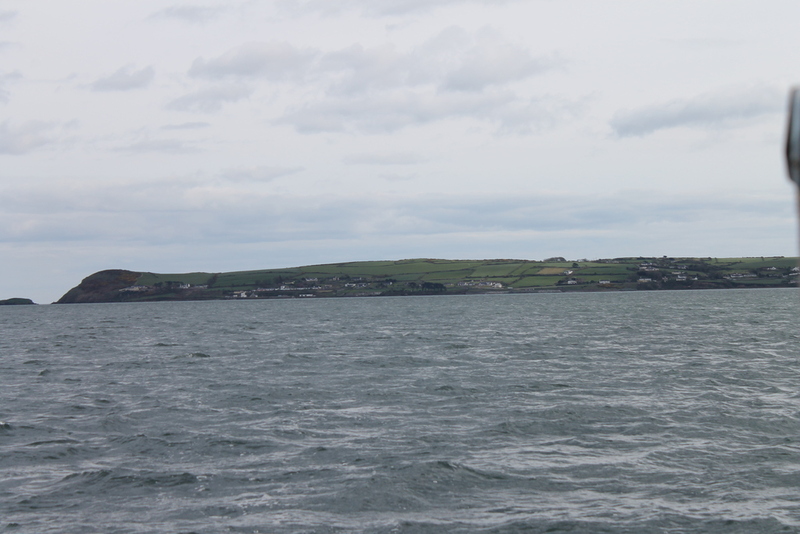 Ballycroneen, home of Channel swimmers Liam Maher and Eddie Irwin, is on the next stretch of coast after Power Head. 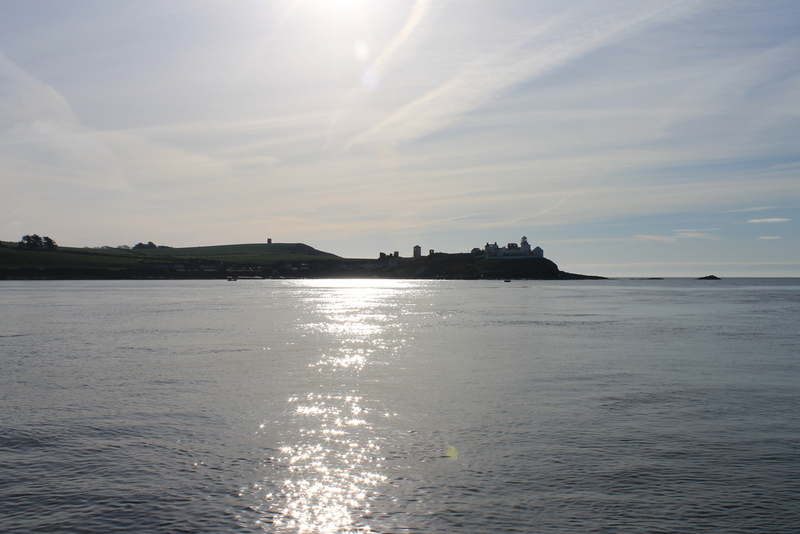 The Magnificent Seven did a 5 hour swim here on the first week of Ned’s Distance Week in 2010. We started 3 hours before all the remaining campers arrived, and finished an hour afterwards, with an hour of unscheduled racing in between. 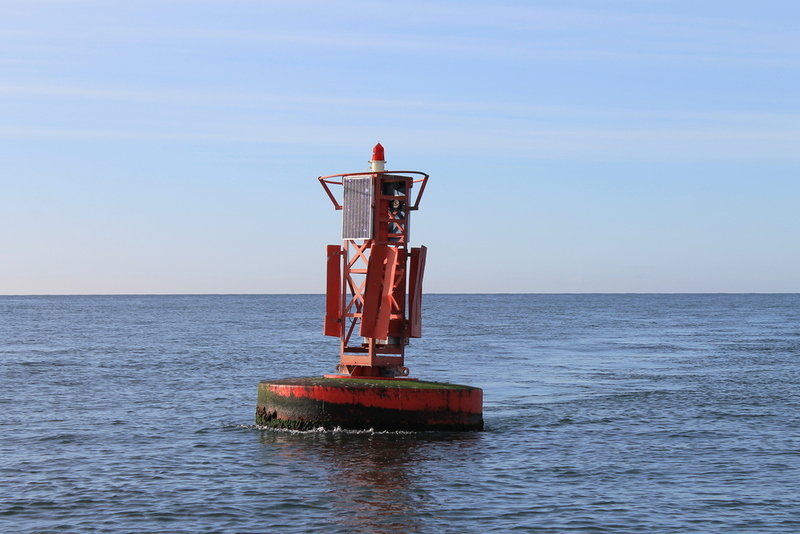 (I just remembered that was another time I fell foul of Finbarr on a buoy turn and Rob ran me into a canoe). 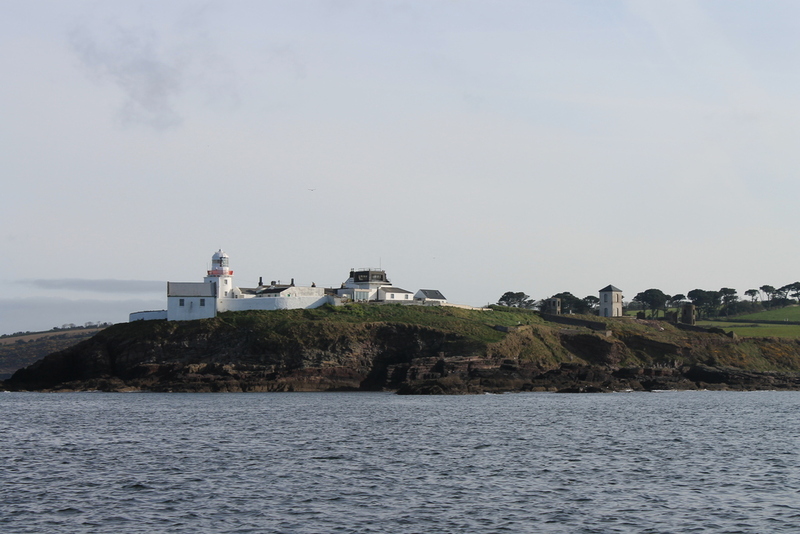 The next headland is Ballycotton village with Ballycotton Island and Lighthouse just off the coast, home to Carol Cashell’s late summer great Ballycotton 4k swim, for advanced open water swimmers only. (I also just remembered I never wrote up that swim last year). Tough conditions. Great swim. 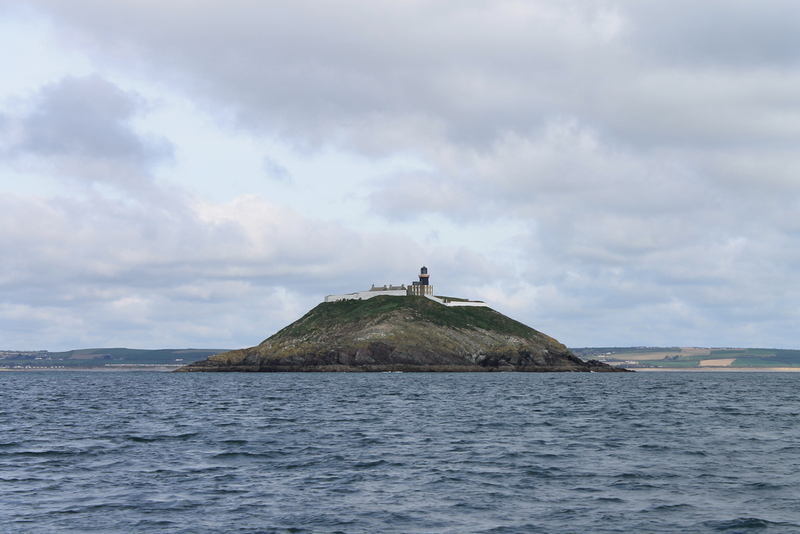 Ballycotton Lifeboatis one of the most famous of RNLI stations for its multiple famous rescues, especially the 19365 Daunt Lightship rescue, having received multiple RNLI medals, two Gold, seven Silver, eight Bronze. 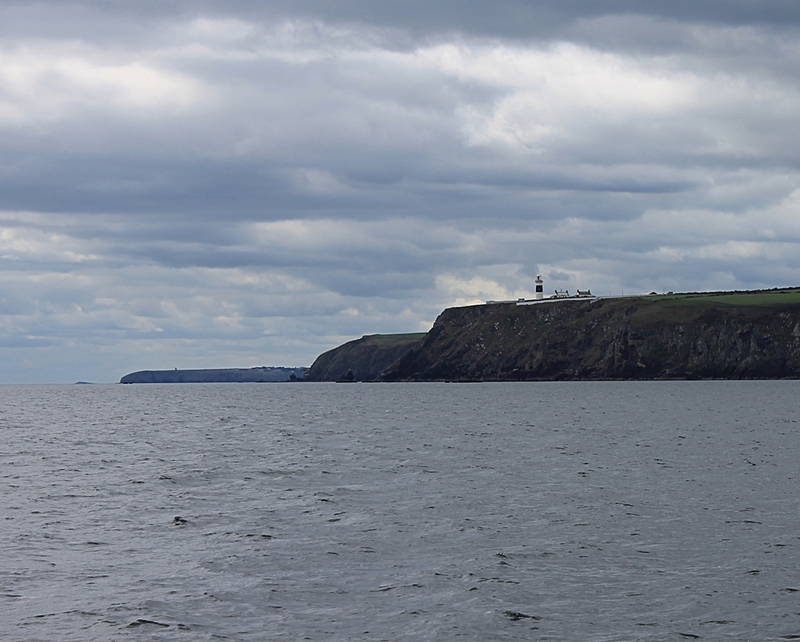 After passing Ballycotton there’s the long flat sweep of Garryvoe, before the coast turns past Capel island across Youghal bay, a long sail north-east before reaching Ram Head and Ardmore, site of Ireland’s oldest Round Tower and possibly the oldest Monastery in the country. With a large telephoto lens the photos are just too dull and the coast too far away. After Ardmore, the coast changes to the beautiful rugged sandstone cliffs of the Copper Coast I showed you so much of last year. 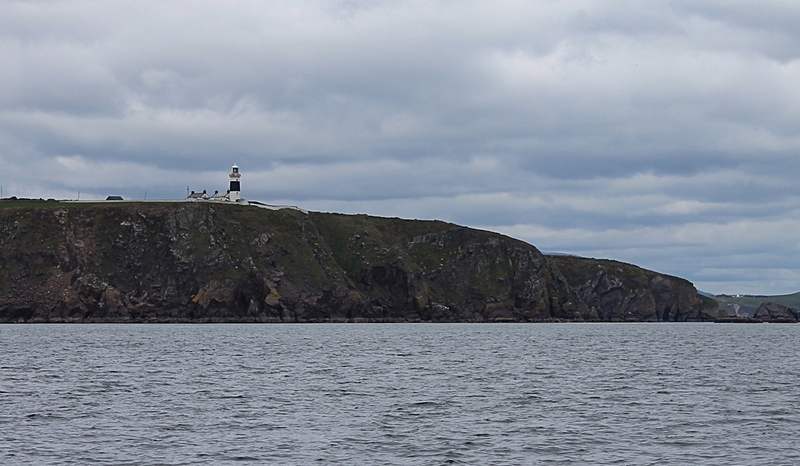 The next landmark is Mine Head, Ireland’s highest lighthouse, also a radio call station for the Coast Guard, and well-known to everyone who’s listened to an Irish sea area forecast. By this stage the sunshine had long departed but the wind never picked up past low Force Three. From Mine Head it’s a quick run to Helvick Head at the end of the Ring peninsula, the entrance to Dungarvan Bay. 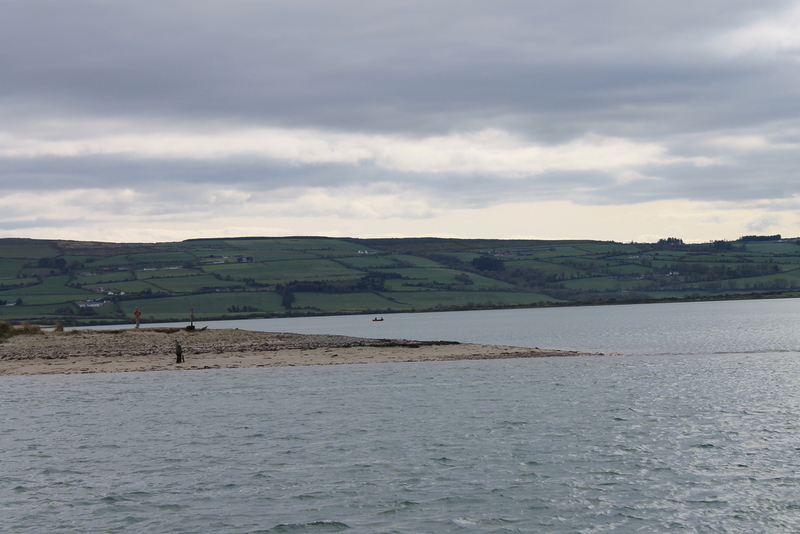 We were outside Dungarvan Bay a bit early, and Clare needed to wait an hour for more tide and draft for the boat. 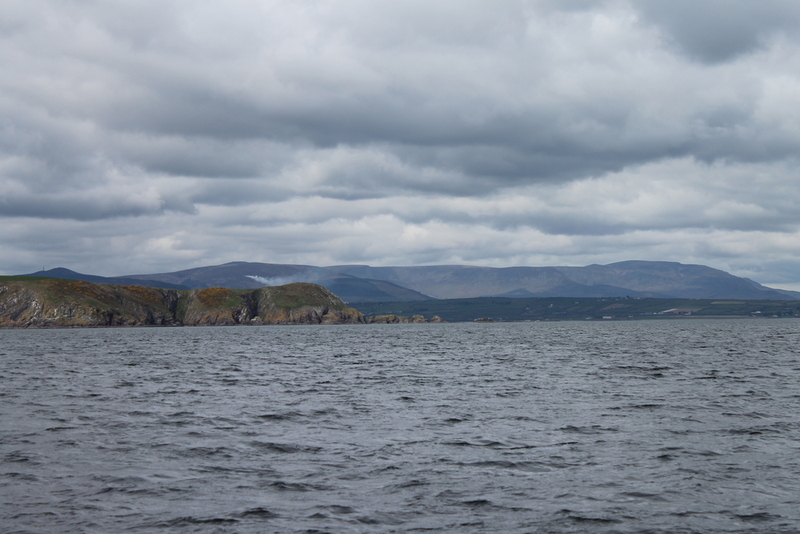 So we sailed past Carricknamoan rock, one of my turning points for swims, but just a rock so not very exciting. 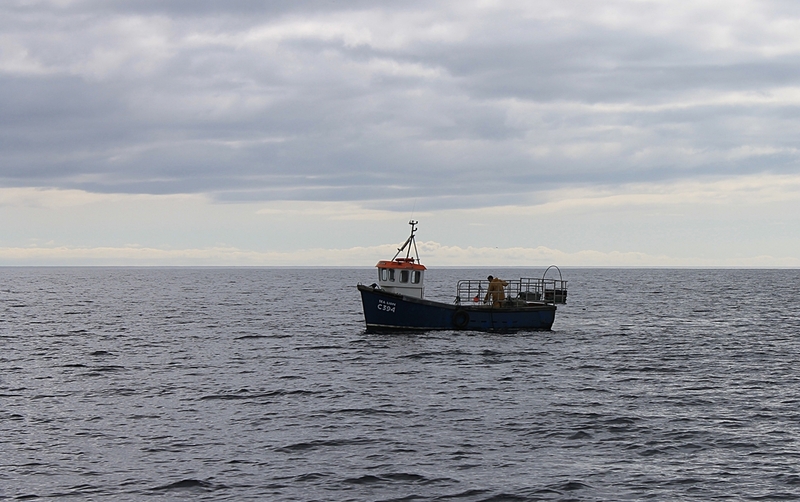 Then a tack left us facing Helvick Head with Mine Head jutting out in the distance. 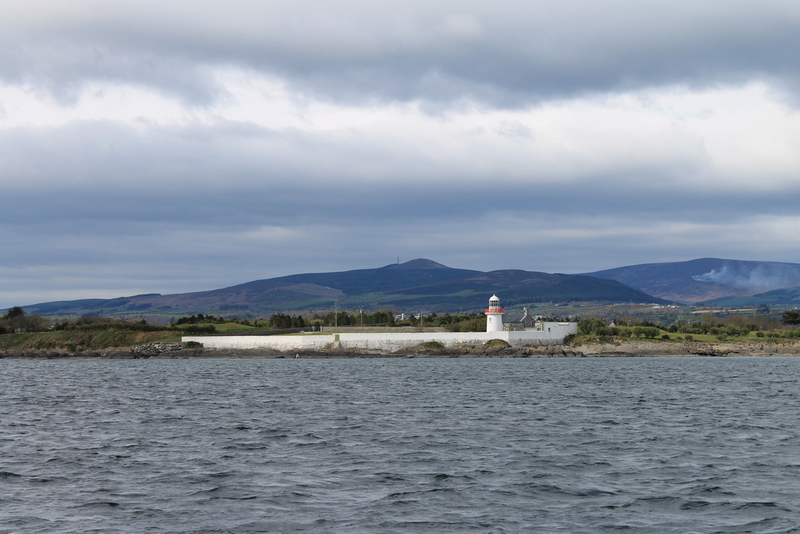 And back past Ballinacourty Lighthouse on the other side of the bay. 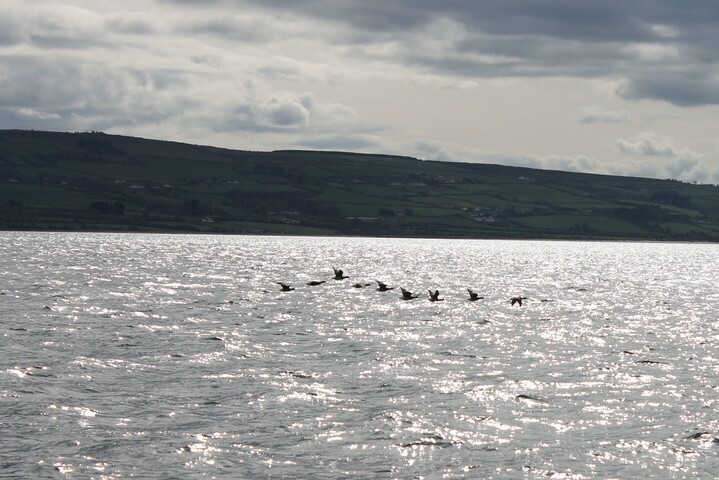 In the bay we saw flight of Mallards returning to the Back Bay tidal lagoon behind the long Cunnigar spit of land that stretches out from the Ring peninsula. Across the bay was Helvick Pier, destination for the Helvick swim. (Study the photo to get a good line if you are swimming this year). 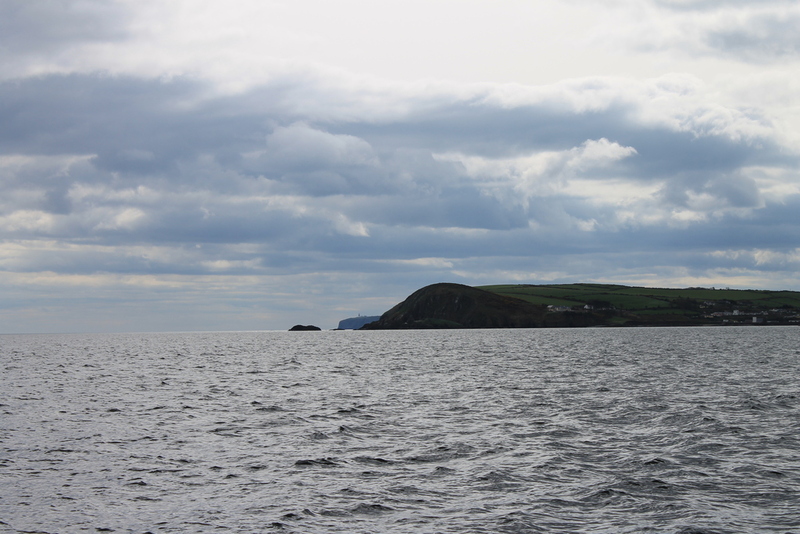 East (town) end of Cunnigar, behind stretches out the flat calm expanse of the Back Bay. 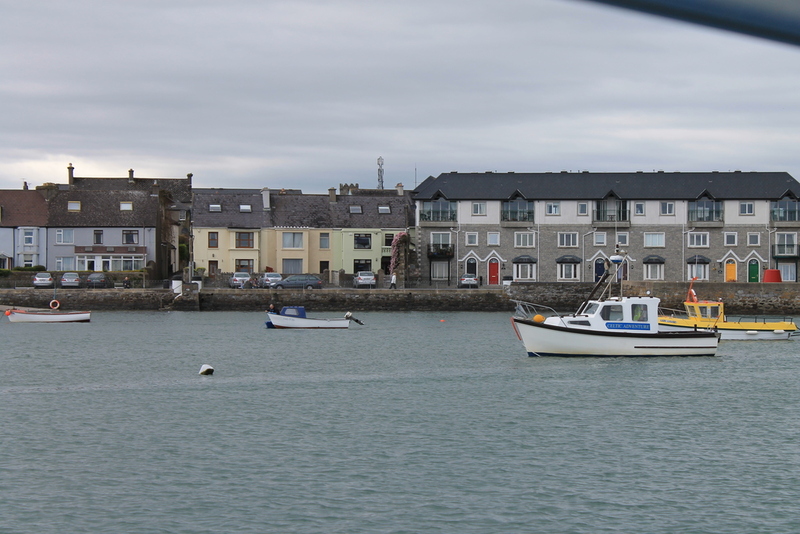 Heading into Dungarvan past the end of the Cunnigar. 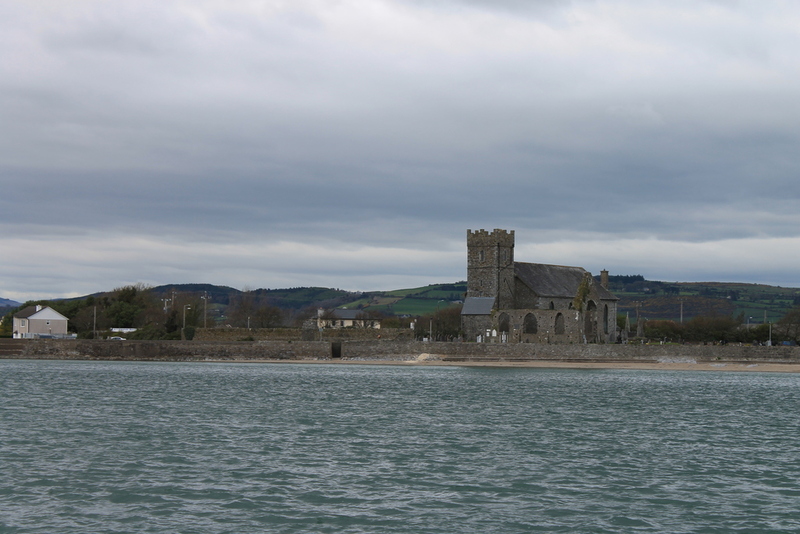 Only two hundred metres or so from Dungarvan, the end of the Cunnigar is a popular beach angling location and subject to extremely strong tidal currents. Dungarvan Lookout. Clare looks out from her house everyday. 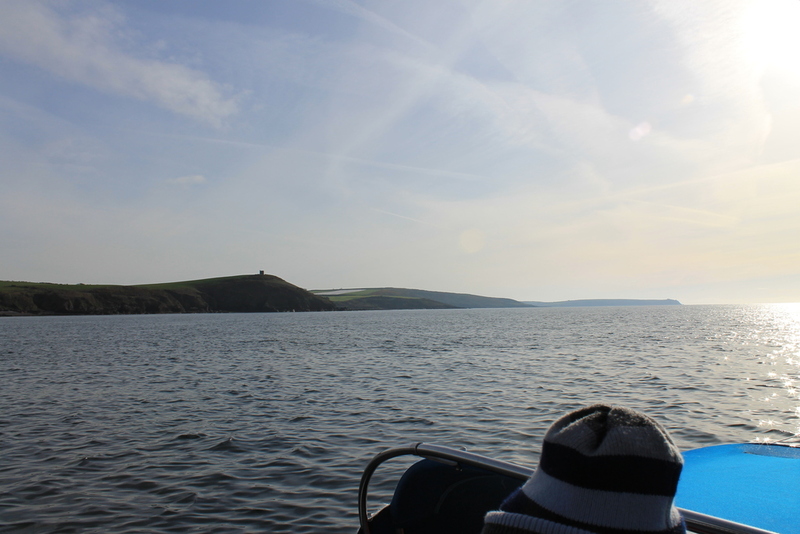 Past Orca’s normal mooring at the Lookout to go into the town pontoon to pick up a dinghy. 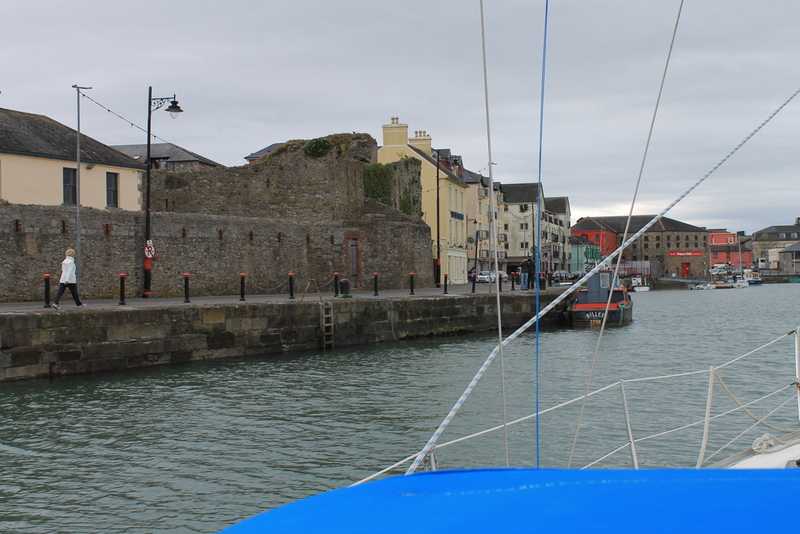 Passing around the old town walls into the inner harbour. 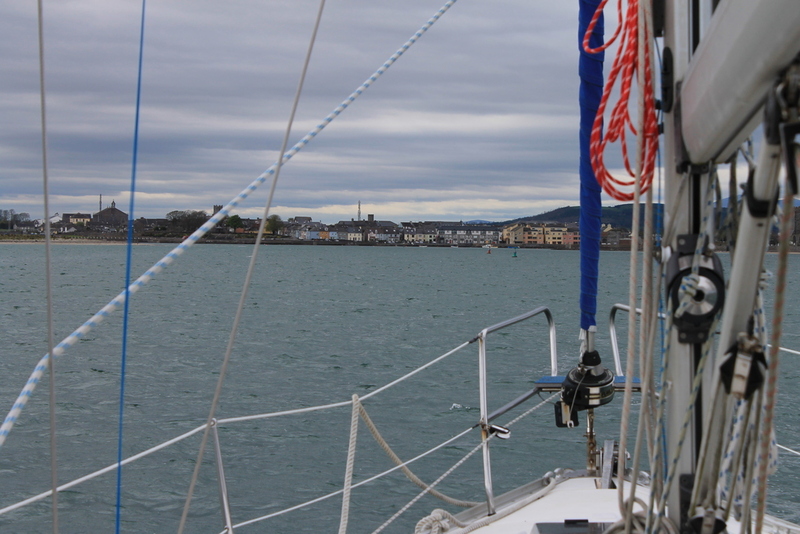 Finally, back in Dungarvan, a fantastic day at sea again, thanks to the Skipper. Inside the town harbour approaching the pontoon.